Richard Parker Gilbanks was born at the Rectory in the pretty village of Gt. Orton just a few miles outside Carlisle. He was one of a large family, with an equally large extended family. His father and grandfather were all ordained ministers and at least one uncle was ordained too! Richard was also studying for the ministry when war broke out. His grandfather had been vicar of Smethwick, Staffordshire for many years. However, his roots were Cumbrian. On his mother’s side his grandfather William Parker was a Justice of the Peace and lived at Carleton Hill, Penrith, for many years; he left over £35,000 when he died in 1892. 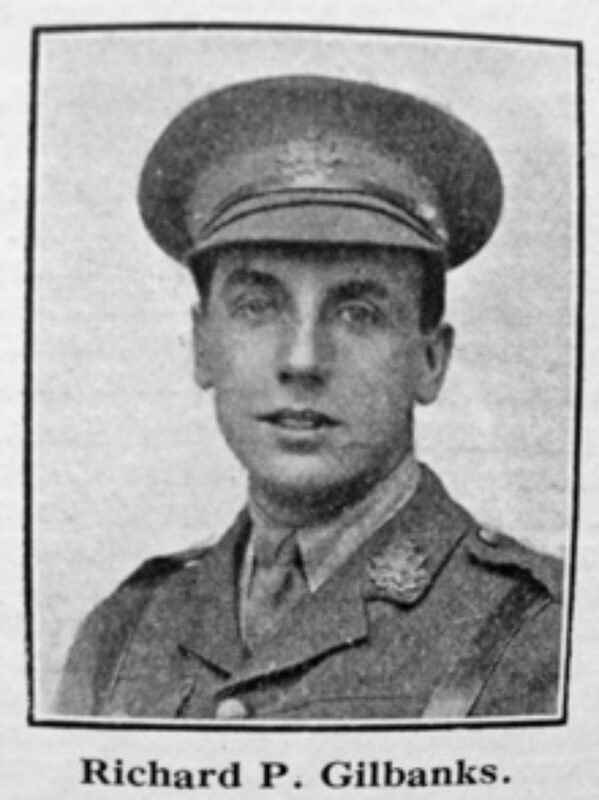 He went straight from Oxford to the army and he joined the 6th Border Regt as soon as war broke out and became a second lieutenant on August 25 1914. He is described as 5ft 10 3/8 ” tall and weighing 144lb. He was sent out to the Dardanelles as part of the Mediterranean Expeditionary Force, he died five weeks after arriving there. In his army personal file his place of death is listed as Suvla Bay, Dardanelles. His burial place is unknown. Richard is also commemorated on the village war memorial in the churchyard at Great Orton. One of the other eight names is that of a local farmer’s son George Norman, who also attended the Grammar School. Richard’s brother Edward Francis was in the Royal Scots Regiment and in July 1917 he was sent to join the British Recruiting Commission in America.